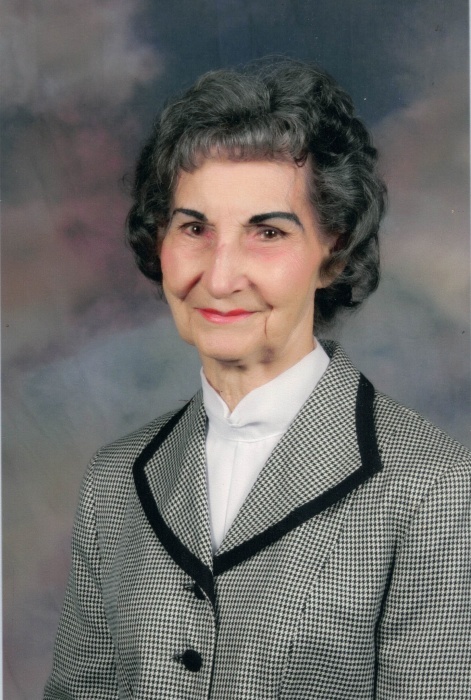 Ethel Melinda Graham Tolley, age 96, of Asheville, NC and formerly of the Piney Grove Community in Marshall, NC, passed peacefully from this world to the next on Friday, April 12, 2019. Born on July 27, 1922, Ethel was one of five children of Arley (Tad) and Nellie Riddle Graham of the Piney Grove Community in Madison County, NC. She married Avery B. Tolley, December 24, 1952 in Asheville, NC. Salutatorian of her high school class, Ethel attended Blanton's Business College in 1940 and went on to work at Dr. TC Smith Company. In 1945, she was employed by the National Air Weather Service for 18 years. In 1965, she formed Tolley Reality, a successful real estate agency in the Asheville area. Ethel had a strong love and loyalty to family and in 1980, she returned to Piney Grove; and with her siblings, cared for their aging parents for the next 15 years. She was outgoing, friendly and always had a positive attitude about living life. Possessing a strong and abiding faith, she was a supportive member of New Bridge Baptist Church. Ethel is survived by a son, Dennis Keith Tolley; daughter-in-law, Shirley Boyd Tolley; grandson, John Keith Tolley; granddaughter, Sadie Elizabeth Tolley; a great granddaughter, Harlee Anne Gregory; and many wonderful nieces and nephews. She was preceded in death by her parents; her husband; a sister, Allie Graham Metcalf; three brothers, Porter, DJ and Fred Graham. Her passing is truly the end of an era and she will be sorely missed by all who knew and loved her. A funeral service will be held at 2pm, Thursday, April 18, 2019 at Piney Grove Baptist Church located at 20 Piney Grove Road, Marshall, NC 28753. The family will be receiving friends at the church from 1pm-2pm. Interment will follow at the Piney Grove Cemetery. The Rev. Wesley Pike of New Bridge Baptist Church will be officiating. Family and friends are invited to a covered dish gathering at the Piney Grove Community Center immediately following the services. The family wishes to thank the skilled nursing staff at Elderberry Health Care Facility in Marshall, NC for the excellent care they provided for Ethel on a daily basis. Penland Family Funeral Home is honored to be caring for the Tolley Family.